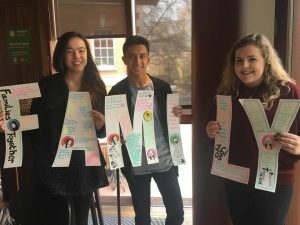 Successful Campaigning on Refugee Family Reunion: Get Inspired! Communities across the country are taking action to show what “family” means to them. From meeting with MPs to holding information stalls at university, it is our collective voice that will change the restrictive rules and help refugee families to reunite. Together, we can make change – but we all need to work together. Showing support for the cause is incredibly easy – you could host an event with friends, to raise awareness of the issue and write letters to your MP; or perhaps send an email to your colleagues, telling them about the Bill and encouraging them to get in touch with their MP? Student groups across the country have organised a range of events, from information stalls to photo stunts, to raise awareness of the campaign. Many linked up with other organizational groups – branches of Student Action for Refugees joined with Amnesty groups, for example – to reach a wider network of people, and ensure that their voices were heard. Could you do something similar? Another way to raise the profile of the #FamiliesTogether campaign is to link with existing events. Could you have a stall at a local market, gig or cafe? Is the touring exhibition, Museum Without a Home, coming to a city near you? Curated by Amnesty International and Oxfam, it displays items that were donated to new arrivals by Greek citizens. People have the opportunity to add to the exhibition as it travels, creating a live and ever-expanding display of solidarity. Leicester Amnesty Students wrote 100 letters to their MP while the Museum Without a Home was in town. Could you do something similar? The Family Reunion Bill, which will be debated on Friday 16th March, needs the support of at least 100 MPs – and for your local representative to vote, they need to know that you care. Write to them here, and ask them to attend the debate. This Bill could change the lives of refugee families who have been separated by conflict and persecution, and who are now kept apart by the UK’s restrictive rules on reunion. Together, we can change this: let’s make our voices heard. Your ticket for the: Successful Campaigning on Refugee Family Reunion: Get Inspired!